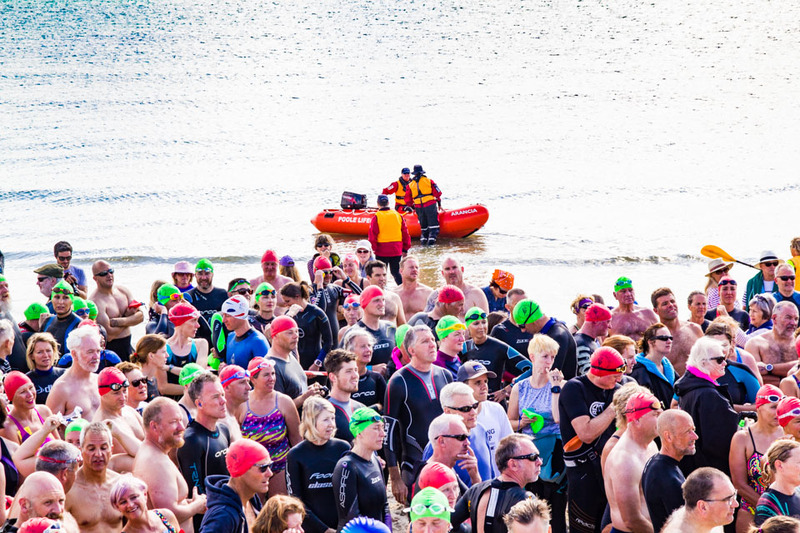 The 2017 Seahorse Swim was possibly the best one yet. 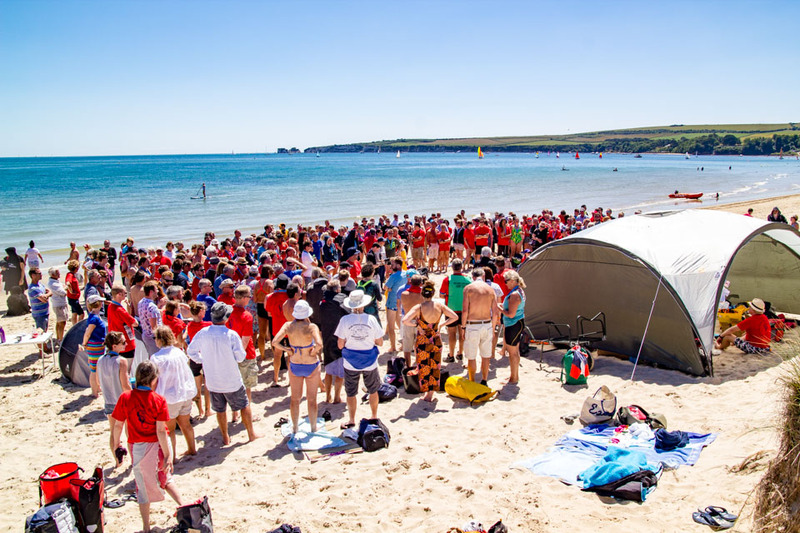 Great weather and a calm sea greeted participants at the beautiful Knoll Beach near Studland. The Seahorse Swim is a 2km or a 3.8km race around a diamond shaped course. There are different categories for wetsuit and skins (non-wetsuit) swimmers and this is reflected well in the results tables. As a wetsuit offers a speed advantage it really makes sense, and is appreciated by all swimmers, to be placed in different results categories. Personally I choose not to wear a wetsuit but wouldn't describe myself as anti-rubber. In fact, the opposite... If wetsuits can help encourage more people in to the sport of open water swimming then so much the better. Having said that the soaring sea temperatures meant that 110 of the 262 starters were in skins. There's a bit of a carnival atmosphere which for many swimmers started in the queue for the Sandbanks chain ferry. The friendly vibe continues as you're greeted by the East Dorset Open Water Swimming Club's parking attendants at the Knoll Beach National Trust car park. It's worth noting that the Seahorse Swim is organised and staffed entirely by volunteers drawn from the club and local swimming community. This is probably one of the reasons that the event is always so much fun as everyone really wants to be there, swimmers, families and event organisers alike. After arrival swimmers are asked to register and are issued with swim cap, T-shirt and timing chip. They then make there way over the dunes to the beach and ready themselves for the pre race briefings. Then it's time to go! I managed a short warm up swim before lining up for the start. I have to admit that I wasn't too organised and was still busy chatting to friends when the hooter sounded. No matter as more by luck than judgement I was in quite a position sand got a good start! The seahorse Swim attracts a wide range of swimmers. It caters for those who I'd describe as seriously competitive but also those those who are just enjoying a swim with friends around a marked course. Not everybody is there for out and out racing of course, but events like these allow people to gauge how effective their swim training has been and allows for some friendly competition. Personally I'm not kidding myself that I'm contending for a top place but was very proud of my hard fought 17th place overall for the non wetsuit 3.8km category and 14th for just the men. Naomi Vides came first overall in the 3.8km non-wetsuit category in a fantastic time of 52:58 whilst Guy Giles recorded the fastest swim time in the 3.8km wetsuit category in 47:10. The 2km non-wetsuit race was won by Christopher Hopton in 27:49 – he was also the fastest 2km swimmer overall so great swimming by him. A full breakdown of the results can be found at the Seahorse Swim timing page.